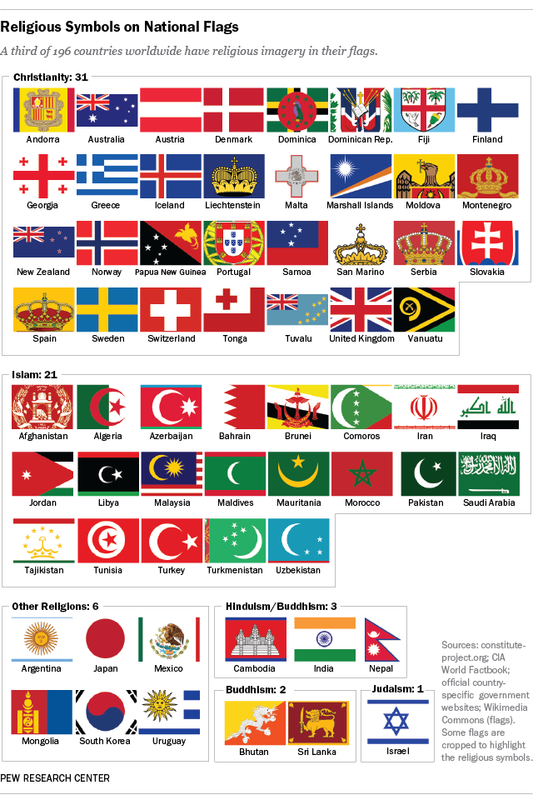 A third of the world’s 196 countries currently have national flags that include religious symbols, according to a new Pew Research analysis. Of the 64 countries in this category, about half have Christian symbols (48%) and about a third include Islamic religious symbols (33%), with imagery on flags from the world’s two largest religious groups appearing across several regions. Christian symbols are found on 31 national flags from Europe, Asia and the Pacific and the Americas. The United Kingdom’s “Union Jack,” for example, includes the crosses of St. George, St. Patrick and St. Andrew. Some Commonwealth countries continue to incorporate the Union Jack as a part of their own flags, including Fiji, Tuvalu, Australia and New Zealand. Spain, Greece, Norway and the Dominican Republic are among the other countries with Christian national symbols. Islamic symbols are found on the flags of 21 countries in sub-Saharan Africa, the Asia-Pacific region and the Middle East and North Africa. In Bahrain, the national flag features five white triangles, symbolizing the Five Pillars of Islam. Algeria, Turkey, Brunei and Uzbekistan are some of the many countries that include an Islamic star and crescent on their national flag. Although Singapore has a crescent and stars on its flag, they do not have religious significance. The crescent moon “represents a young nation on the ascendant, and the five stars depict Singapore’s ideals of democracy, peace, progress, justice and equality,” according to the Singapore government. Buddhist or Hindu religious symbols appear on five national flags; in three of those cases, the symbols apply to both religions. The Cambodian flag depicts Angkor Wat, a temple historically associated with both Hinduism and Buddhism, while in Nepal, the flag features both Buddhist and Hindu symbols to represent the two predominant religious groups in the country. And in India, the blue chakra at the center of the flag holds symbolic meaning for both Hindus and Buddhists. Israel is the lone country with Jewish symbols on its national flag, including the Star of David and a white and blue striped background representative of a traditional Jewish prayer shawl. Six countries have symbols associated with various other religions on their flags. The Japanese flag, for example, includes a hinomaru, or rising sun – representative of Shinto spiritual roots within the former Japanese empire. In Uruguay and Argentina, both national flags include shining golden suns believed to be representative of the Incan sun god Inti. And the Aztec god Huitzilopochtli can be seen on the Mexican flag as an eagle perched atop a cactus with a snake in its beak – a legendary image that was believed to have appeared to the Aztec people, instructing them to build the ancient city of Tenochtitlan. Although the U.S. flag does not include any religious symbols, several states have religious imagery on their flags. For instance, the state flag of New Mexico includes a red sun with its rays extending outward, representing the spiritual history of the Zia Pueblo. Some U.S. states, including Alabama and Florida, continue to feature adaptations of the St. Andrew’s cross. Sources for this data include constituteproject.org, the CIA World Factbook and official country-specific government websites. Download the data used in this analysis here. Correction: An earlier version of this post incorrectly stated that India only had a Hindu symbol on its flag. Imagery on India’s flag has symbolism for both Hindus and Buddhists.